We got crazy in the kitchen in our search for the perfect healthy pizza crust... and the results are well worth the effort! 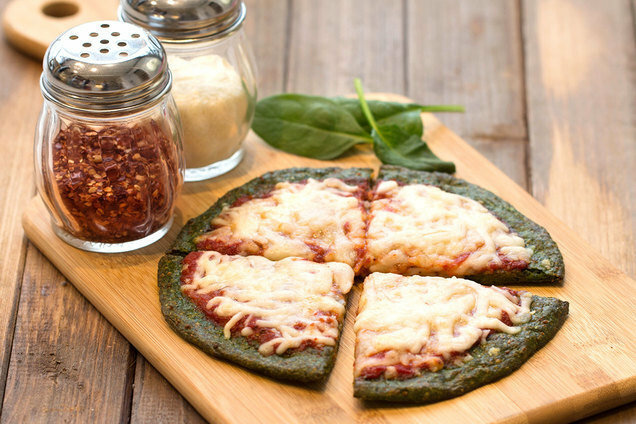 Our new spinach-crust pizza is flavorful, high in protein, and all-around amazing! You need to make this now. Like, NOW now. Place all crust ingredients in a food processor. Puree until uniform. Pour crust batter onto the center of the sheet. Using a spatula, form it into a circle, about 1/4-inch thick and 6 inches in diameter. Bake until top has browned and edges are slightly crispy, about 20 minutes. Meanwhile, in a medium bowl, combine crushed tomatoes, Italian seasoning, onion powder, and garlic powder. Mix well. Remove sheet from oven. Spread seasoned tomatoes over crust, leaving a 1/2-inch border. Sprinkle with mozzarella cheese. Bake until cheese on top has melted and crust is mostly crispy, 8 - 10 minutes. Hungry for More Healthy Pizza Recipes? It's Groundhog Day! If Punxsutawney Phil saw his shadow, click here for a winter-perfect veggie soup. If spring is coming early, get ready with this Spring Sriracha Egg Mug. Click "Send to a Friend” now, so your pals will have time to make it for dinner tonight!